Our Mayor Bill DeBlasio (original name Warren Wilhelm) speaks of "a tale of two cities", but there is another tale. The tale of the unequal tax assessment of real property in New York City. We recommend that you read A History of the Real Property Tax and Equalization in the State of New York for a discussion of the history of this situation. This is a preliminary analysis of the New York City Assessment of Property Value over the Market Value. The ratio of the these two values seems to cap at 6%. There seems to be a lot of tradition and black magic in these traditions. But if you improve your home legally then the full value of the improvement is added to your market value and also proportionally added to your assessed value. Which in turn increases your tax payment proportionately. This seems to be a counter incentive. We punish people that invest in their homes with real improvements and do nothing or little to those that speculate or buy homes at high or inflated prices. Why??? We should encourage people to renovate their homes. There are programs to abate taxes for improvements but these are limited programs and you have to do that before you start renovation. In some cases, you buy a renovated home from a developer and you were not involved in the renovation, yet the tax increase will be applied and it appears you cannot file for an abatement after the fact. 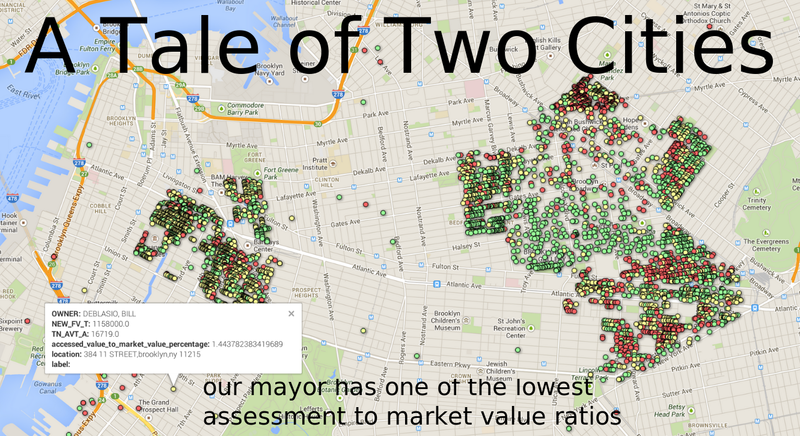 Comparing some of our mayor's assessment ratios. Bloomberg comes in at a middle value of 3.61% and an assessed value of $615K on a $17 Million home. While our current mayor Deblasio assessed ratio is a low 1.4% on an assessed value of $16.7K on a $1.15 Million home.